Because of the high economic value of fruiting vegetables and the corresponding low tolerance for pest damage, management programs are largely preventive in nature – they focus on controlling direct pests (i.e., those that feed on and damage fruit) before they develop to potentially damaging levels instead of waiting until damage appears. Thrips and flea beetles are early season pests that should be controlled before fruit are present, while aphids, spider mites, stink bugs and armyworms are mid-to-late season pests. 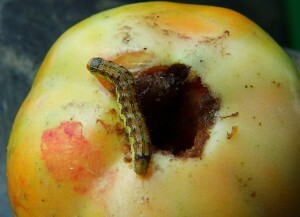 Tomato fruitworm is a potential season-long pest. Insects listed under sporadic pests are generally not an annual problem in the majority of fields. However, when they do occur they have the potential to cause serious economic damage. 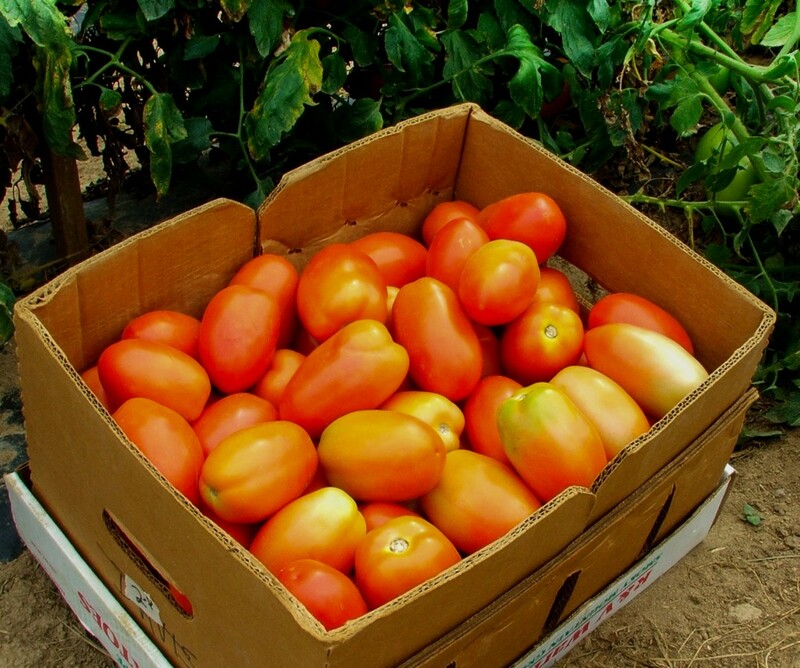 Among these pests, European corn borer and pepper maggot are specific to peppers, broad mites are specific to pepper and eggplant, Colorado potato beetle is an early season pest of tomato and eggplant, and whiteflies are a late-season pest of tomato and eggplant. FLEA BEETLES: The potato flea beetle, eggplant flea beetle, and tobacco flea beetle feed on leaves beginning shortly after transplanting. Eggplant is particularly susceptible to flea beetle damage, but tomato and pepper quickly outgrow the injury and the damage generally has minimal impact. 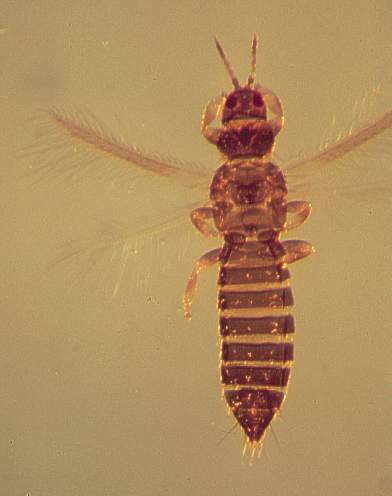 THRIPS: There are several species of thrips that can attack tomatoes from the time of transplant through the summer months. Tobacco thrips and western flower thrips (WFT) both transmit tomato spotted wilt virus (TSWV), with tobacco thrips important early in the season (April and May) and WFT an important vector during the summer months (June and July). The incidence and severity of TSWV varies considerably among locations and years. WFT and the common flower thrips also infest flowers and can cause damage to small developing fruit that is expressed in the form of dimples in mature fruit. This damage is more often associated with WFT as opposed to the common flower thrips. WFT can also cause gold fleck. 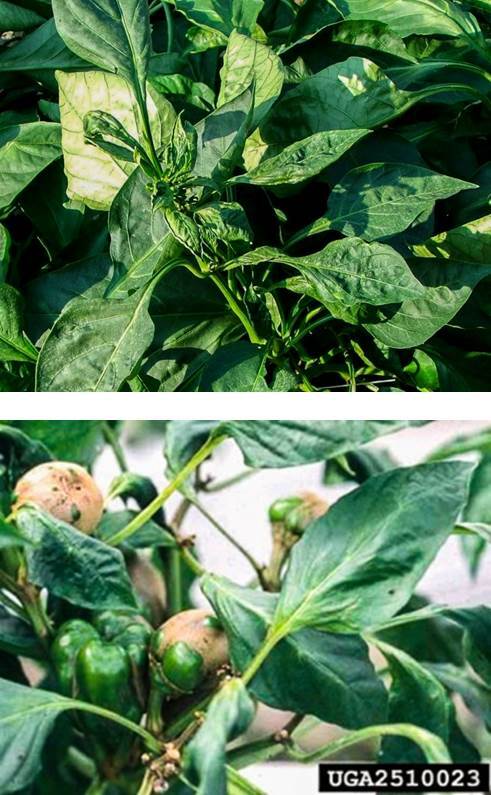 APHIDS: The potato aphid, which is usually red and feeds on the top leaves, and the green peach aphid, which is cream colored and feeds on mid- and upper-leaves, are common pests if not controlled. Many insecticides applied for other insect pests usually control aphids, so they are infrequently observed in commercial fields. STINK BUGS: The brown stink bug and green stink bug are two native species that commonly attack fruiting vegetables. The invasive brown marmorated stink bug has rapidly increased in importance in the piedmont and mountain regions of NC. The severity of damage varies greatly among locations, with crops adjacent to woods or near corn fields appearing to be the most susceptible. 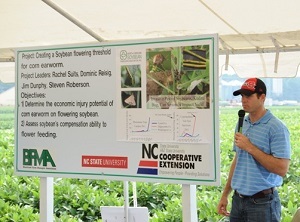 TOMATO FRUITWORMS: The tomato fruitworm, more commonly known as the corn earworm and cotton bollworm, is the most common lepidopteran pest of fruiting vegetables in NC. It is an annual threat to crops from fruit set through harvest, and failure to control it can result in greater than 50% of fruit being damaged. ARMYWORMS: Several species of armyworms commonly infest fruiting vegetables throughout NC, including the yellowstriped, southern, and beet armyworm. Armyworm damage is different from tomato fruitworm in that larvae often feed extensively on leaves in addition to fruit, whereas tomato fruitworm feeds almost exclusively on fruit. 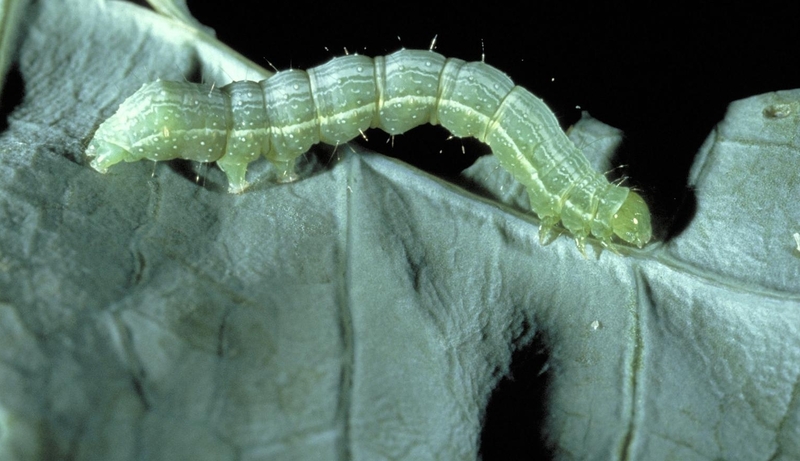 CABBAGE LOOPERS: Although known primarily as a pest of cole crops, the cabbage looper can also be an important pest of tomato and pepper. In recent years it has been a common pest of fruiting vegetables in August and September. 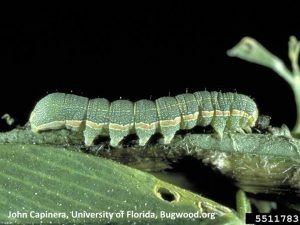 Its feeding habit is similar to that of armyworms in that it feeds on foliage before causing fruit damage. 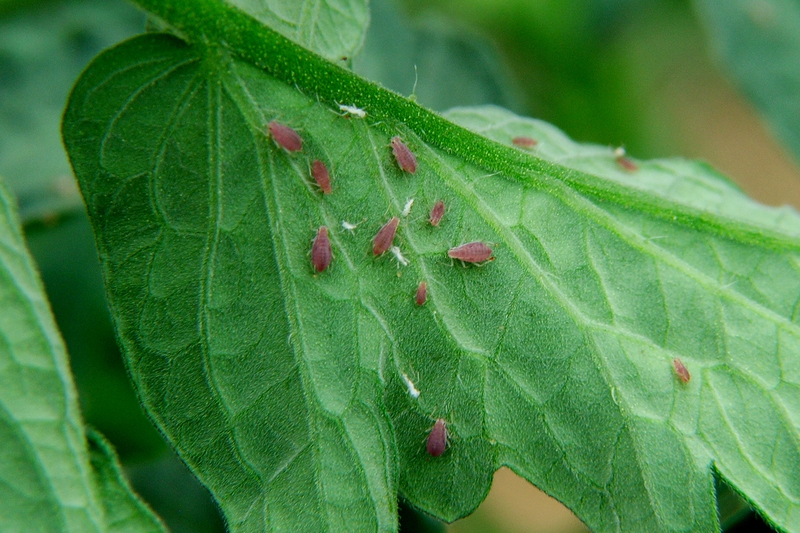 SPIDER MITES: Twospotted spider mite, and occasionally the carmine mite, is a common pest of tomato and eggplant. Large mite densities can cause gold fleck on fruit and premature senescence if not controlled. The economic threshold level is an average of only about 2 mites per leaflet (sampled from the upper strata of the plant). Pyrethroid insecticides often flare populations. Broad mites, which are very small and more frequently occur on pepper compared to tomato or eggplant, cause distortions of terminal growth on leaves and russeting on fruit. There are several other insects that are less common that those described above, and they usually do not build to damaging levels or require control on an annual basis. White flies are perhaps the most common sporadic pest in NC in that they can often be observed in low numbers in many fields, but usually do not increase to high numbers until later in the season when plants can tolerate relatively high densities. 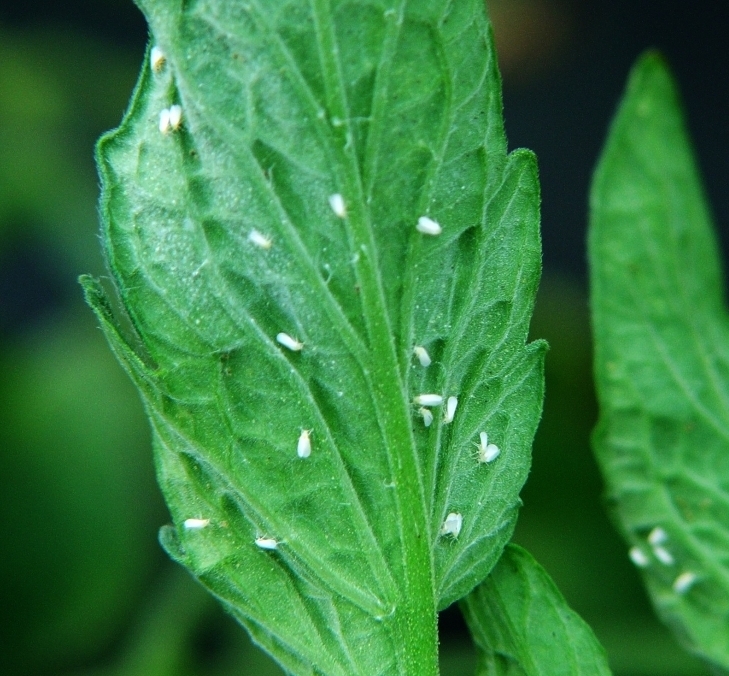 Both the greenhouse whitefly and silverleaf whitefly occur on tomatoes in NC, most commonly on tomato eggplant. Instances in which whiteflies are important problems are usually related to using infested transplants. 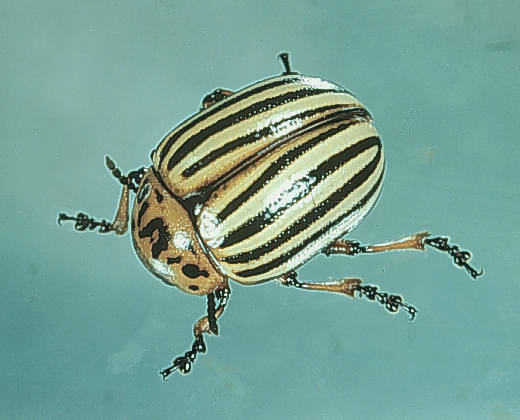 The Colorado potato beetle is an early season pest of tomato and eggplant that can rapidly defoliate plants if not controlled. However, it is more of a problem in gardens and small plantings than in commercial fields. Treating plants with imidacloprid in transplant trays before planting in the field often controls both CPB and whiteflies. The tomato pinworm is a sporadic late-season pest that is more common in eastern vs. western North Carolina. It does not overwinter in NC, so populations must move from more southern regions (e.g., Florida). Broad mite damage to leaves (top) and fruit. 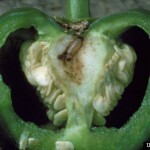 There are several arthropod pests that are more common on pepper than tomato or eggplant. 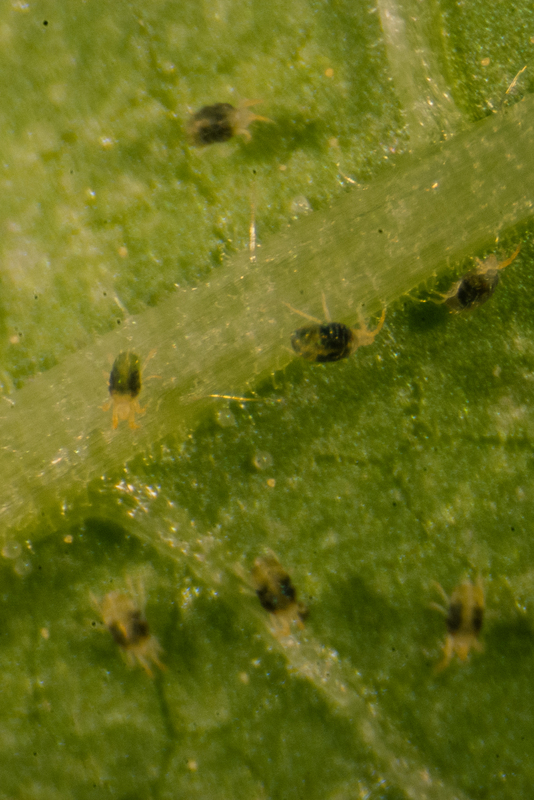 The broad mite is a very small mite that feeds on the apical growth of peppers and less frequently eggplant. It is a very small mite that requires the use of magnification to be seen. The first sign of broad mite presence in peppers is distorted growth of new foliage, followed by heavily scarred or russetted fruit. 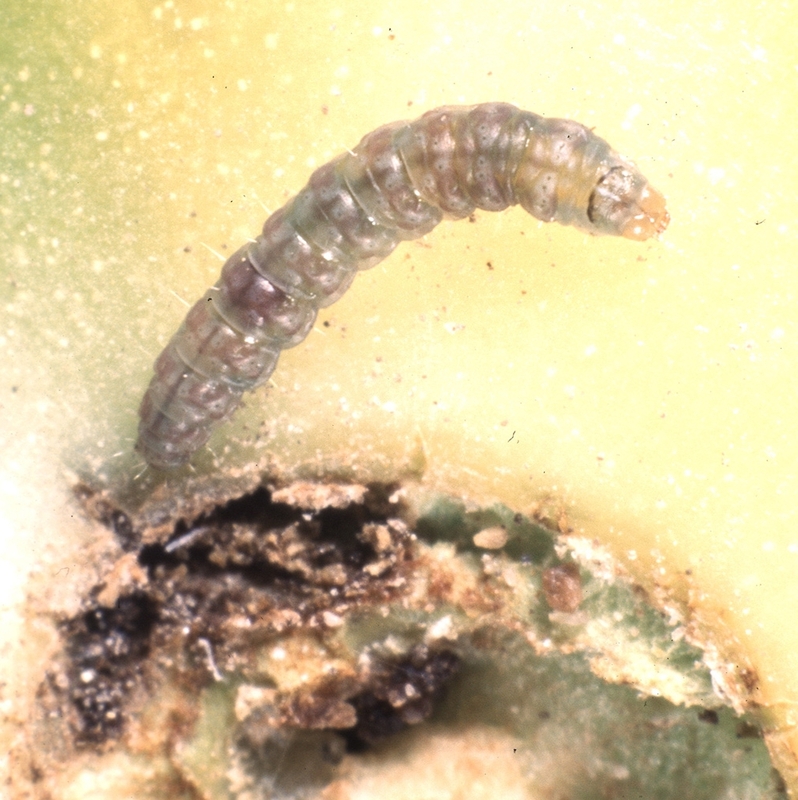 The European corn borer was once a common pest of pepper, but the widespread use of genetically modified corn resistant to corn borer has drastically reduced European corn borer populations, and has helped relegate it to minor pest status on many crops. 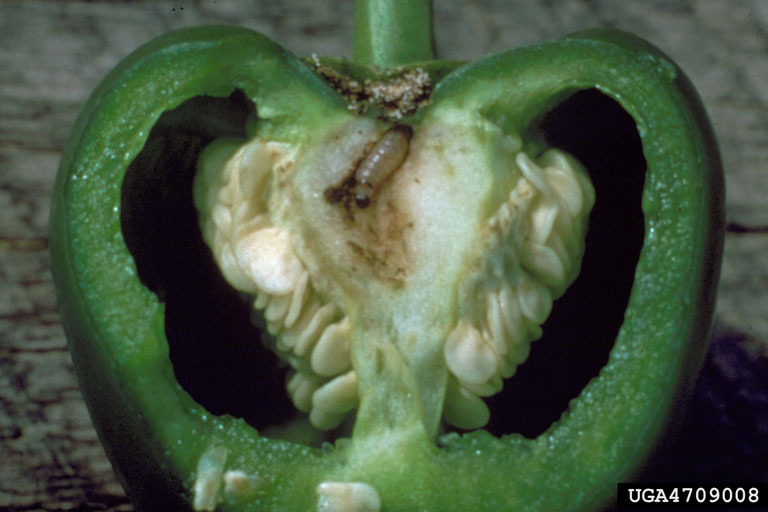 Pepper maggots and pepper weevils are rarely observed in peppers grown in NC, but can be very problematic in more southern production regions. Due to the low tolerance for damage to these high value crops, insecticides play an important role in managing arthropod pests. 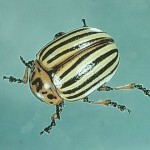 There are a wide range of insecticides with different modes of action registered for use on fruiting vegetables, and knowledge of the pest(s) present in the field at the time of applications and the efficacy of the various insecticides against specific pests is critical to achieving effective control. Treating transplants with imidacloprid several days before setting in the field is highly recommended, because it provides early season control of aphids, flea beetles, and tobacco thrips, and can reduce the incidence of TSWV where that disease is a concern. If using imidacloprid, foliar insecticide applications are usually not needed until the first fruit appear. Historically, foliar applications of insecticides using high pressure boom sprayers have been the most common approach to using these tools. However, in recent years a number of insecticides with systemic activity have been registered that control a wide variety of insect pests when they are applied near the root zone of plants using soil drip irrigation systems. This application technique is referred to as chemigation, and as outlined below offers several advantages to conventional foliar applications. (1) Insecticides within the same MOA Group have the same mode of action. (2) There are numerous pyrethroids registered on fruiting vegetables; certain products may differ slightly in efficacy. Commercial products include, but are not limited to: Asana, Baythroid, Brigade, Danitol, Karate, Mustang Max, Perm-Up, and Proaxis. Check labels for preharvest intervals because they vary among products. 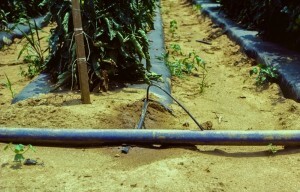 (3) These insecticides can also be applied to the soil, including via drip irrigation. Soil applications provide much longer residual control (months vs. days). Exirel is for foliar application and Verimark is for soil application. Check labels for PHI and application method. Drip Chemigation: The use of drip chemigation (application of pesticides through the drip irrigation system) can control most key insect pests of fruiting vegetables and greatly reduce the need for foliar insecticide applications. Application of systemic insecticides belonging to the neonicotinoid and diamide classes of chemistry are taken up by roots and translocated throughout the plant to provide relatively long residual activity – ranging from 3 to 8 weeks, depending on the insecticide and the growth stage of the crop. Western flower thrips and mites (twospotted spider mite and broad mites) are two pests that have escaped control using chemigation. 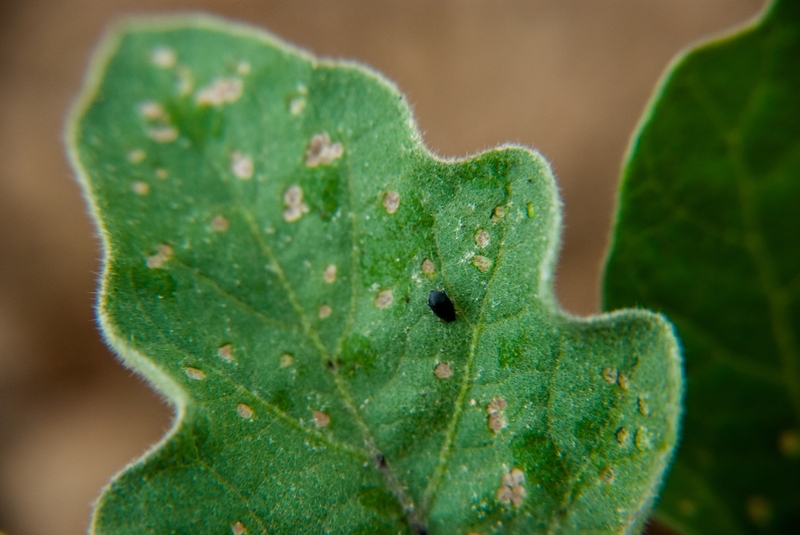 Hence, scouting programs should pay particular attention to these pests to determine the need for supplemental foliar applications to control these pests. In recent years cabbage looper has become a relatively common pest of tomatoes, and evidence suggests that this this may be due in part to the reduced efficacy of diamides against this pest. 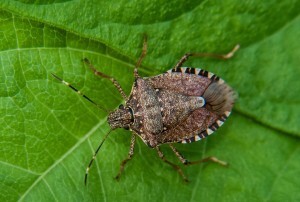 Finally, late season stink bugs can also escape control and may require supplemental foliar sprays. Aphids, whiteflies, flea beetles, tobacco thrips. Do not apply more than 4 days before setting in the field. (1)There are numerous generic formulations of imidacloprid that can be used instead of Admire Pro. Be sure to read the label for rates, because different products contain different amounts of active ingredients. Image credits: Thrips, Colorado potato beetle, broad mite damage, European corn borer, irrigation line: J. F. Walgenbach file, NCSU; looper, armyworm: John Capinera, University of Florida, Bugwood.org; pinworm: Alton N. Sparks, Jr., University of Georgia, Bugwood.org; all others: Steve Schoof, NCSU.